Why? — Real. Weird. Art. I POST IT Craigslist, JUST TO see if ONE PERSON BOTHERS REPLYING, IF ONLY TO SUGGEST COUNSELING. I AM STARING AT MY INBOX. twenty people want MY PENGUIN. IT'S a hot dog holding quarters. 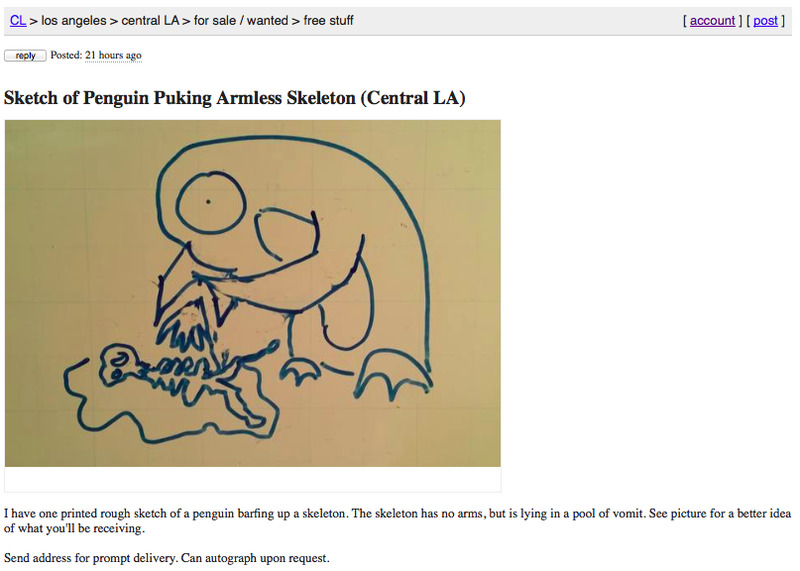 It makes the Best of Craigslist. the next twenty days are a blur. I AM doodling, uploading, mailing THINGS to awesome people who somehow love THESE PIECES as much as I do. I can't remember EVER FEELING this happy. I bump into a street artist and she asks if I'm an artist. I show her SOME drawings and she tells me I SHOULD show my work IN union square. a month goes by before I work up the nerve to come. a portfolio of glorified doodles I know no one wILL BUY. thousands of people pass WITHOUT glancing. I COME TO TERMS THAT THIS WAS all TOO GOOD TO BE TRUE. something catches a stranger's eye. I still can't believe this is my "job", and yet thanks to support from Folks like you, real. weird. art. has grown from a little barfing bird to a full-time career. I like to think I am good with Words, but there's no way TO ever come close to expressing THE gratitude i FEEL FOR you providing ME this dream of a life.